Wheelchairs are able to be carried in the Guard's Van/Buffet Car on the Flying Scotsman’s services but are limited, and if the passenger has some mobility then they should book seats in nearby passenger accommodation coaches rather than travel in the Guard's Van. Our trains have corridor connections between the coaches. Please note that the disabled spaces are only available for our disabled passengers. If these spaces are used by able bodied passengers you will be asked to vacate these spaces. Please contact kim.shaw@nvr.org.uk with your booking reference after you have booked you tickets, to discuss your mobility issues so we can provided you the best assistance. We are pleased to announce that Flying Scotsman will return to the Nene Valley Railway for public running in late summer. The locomotive will be in public service for 3 running days and we are also planning some special static days to get up close and personal to Flying Scotsman, tickets must be purchased in advance for a trip behind this iconic locomotive, the advance date for tickets going on sale will be announced. Our Popular Jolly Fisherman Fish and Chips service will also be operating hauled by the locomotive and an evening Dining train will be operating offering a full three course meal hauled by 60103. The locomotive appears with kind thanks to the National Railway Museum and Riley & Son (E). We are currently planning the visit and all details, updates will appear on our web page, please do not contact our office for enquiries, all the current information will be published on our web page. The locomotive was built in Doncaster becoming the first locomotive of the newly formed London and North Eastern Railway (LNER). It left the works on 24 February 1923 with number 1472. It was designed by Sir Nigel Gresley as part of the A1 class – the most powerful locomotives used by the LNER at that time. By 1924, when it was selected to appear at the British Empire Exhibition in London, the loco had been renumbered 4472 – and had been given the name ‘Flying Scotsman’ after the London to Edinburgh rail service which started daily at 10am in 1862. The British Empire Exhibition made Flying Scotsman famous, and it went on to feature in many more publicity events for the LNER. In 1928, it was given a new type of tender with a corridor, which meant that a new crew could take over without stopping the train. This allowed it to haul the first ever non-stop London to Edinburgh service on 1 May, reducing the journey time to eight hours. 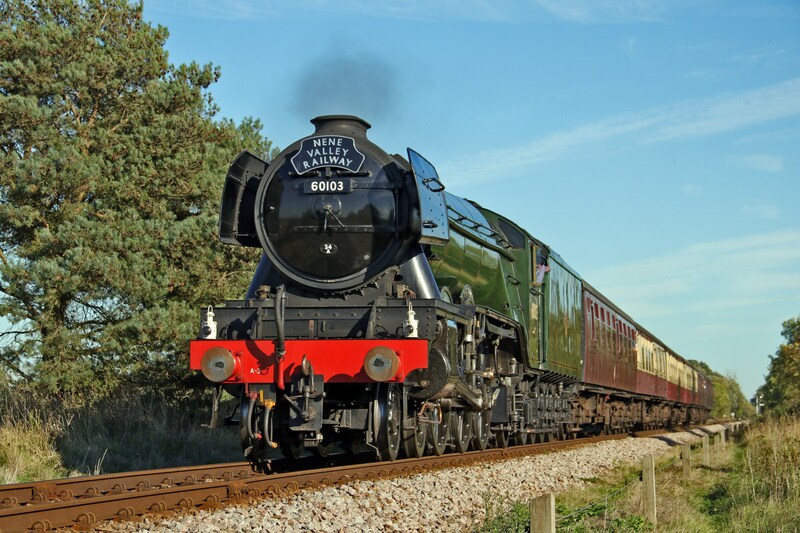 Advance purchase tickets only available for travel behind Flying Scotsman including the Dining events. Exclusive Flying Scotsman Special Event covers will be for sale on the train ONLY. A shuttle service will also be available for passengers to arrive at Wansford to board Flying Scotsman services. We are pleased to announce that Railway artist Wrenford Thatcher will be present with his gallery at the Flying Scotsman event, with a full display of artwork, Meet Wrenford and see him at work painting over the weekend. To see his work click here. Passenger services are availble to non Flying Scotsman passengers, but access to these passengers will be restricted at Wansford to the Shop, Cafe and trade stand areas. If you are heading out to see Flying Scotsman please remember to follow the rules of the railway and only go where permitted, the railway will be very busy over the visit with many trains running as well as Flying Scotsman, Flying Scotsman can be seen in action safely from our stations and around our stations, please do not encroach on to the railway or running lines. The safety of all our customers is paramount as well as the running of the trains. Our line side is clearly marked and is fenced off for the safety of our trains and everyone. Please make this visit a safe one and an enjoyable one for everyone. Stay safe and away from the running lines. Car parking will be limited at Wansford to Flying Scotsman Ticket holders only and we advise that where possible you travel on our timetabled shuttle service to and from Wansford, as a Flying Scotsman ticket holder we are pleased to offer you unlimited travel on our shuttle service. Free parking can be found at Orton Mere, and payable parking at the Ferry Meadows County park for the shuttle services. Please note that the NVR will not be responsible for any tickets sold on after purchase from this official web page and it is possible that tickets sold fraudulently will be refused on the day of travel.